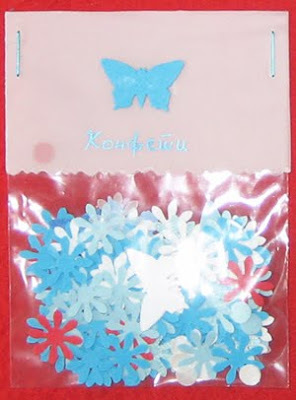 Handmade confetti that were never tossed (mainly because we forgot about them - lol!). 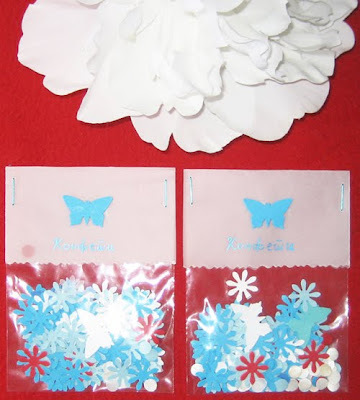 I hand-punched each flower, butterfly, dragonfly, and circle in those bags, then made the vellum tags with glued paper butterflies that say "Confetti" in Macedonian in glitter gel-pen. The other side features our initials "M & V" in white gel pen. The idea to make the confetti myself came to me as I was making the favor boxes from regular card-stock I got from Michaels. There was so much scrap paper left that I kept it in jars planning to use it for handmade paper (something I would still like to do at some point in the future). Instead, I punched a whole bunch of little things to toss - in the colors of our wedding: red, white and aqua. Also, I never liked the idea of throwing plastic confetti near a lake, so these were the bio-degradable option. Too bad we forgot to take them with us to the ceremony, or to the reception... We had other things on our minds, so these little handmade dears were left behind.